CO192: Experiential Marketing Agency that works with national and international companies, Brands and Products to drive Behavior-changing results and specializes in the Design and Execution of live events, field marketing, sponsor activation, digital media, exhibits and environments - $40MM Revenue - $3.2MM EBITDA. CO212: Leading Publisher of Instructional Content for Musical Instrument Playing. CO214: Manufacturer of Innovative Products that Resolve Drywall Installation Issues - $2.5MM EBITDA. CO215: A Niche Fabricator of Heavy Steel Process Equipment for the Petrochemical and Steel Industries - $17.7MM Revenue. CO62: Specialty Contractor Seeking add-on Acquisitions. CO138: Kansas City-based Private Investor Seeking to Acquire companies Headquartered within 50 mile radius of Kansas City. CO201: Manufacturer of complex, engineered components for the Aerospace, Defense, First Response, Safety, and Medical markets Seeking Acquisitions with revenues up to $15MM. Aviation control systems and/or products regulating the flow of oxygen are of particular interest. CO203: Privately held manufacturer and marketer of highly recognized Laundry, Household Cleaning, Air Care, and Lawn & Garden branded products Seeking Acquisitions with revenues up to $15MM. Proprietary and/or highly engineered products preferred. Clayton Capital Partners is pleased to announce the sale of its client, Electrical Wholesale Supply to Border States Industries, Inc.
Electrical Wholesale Supply (www.ewsutah.com), based in Salt Lake City, has long been recognized as one of the top electrical supply companies in the United States. Border States Industries, Inc. (www.borderstates.com), based in Fargo, ND, distributes electrical and electronic products for the construction, plumbing, industrial maintenance, datacomm, renewable energy, and utility industries, among others. Clayton Capital Partners is pleased to announce the sale of its client, WorkForce Employment Solutions to Employment Staffing, Inc. WorkForce Employment Solutions (www.visitworkforce.com), based in St. Louis, MO, is recognized as one of the Nation’s fastest growing staffing firms placing thousands of candidates each year with hundreds of respected regional companies. Employment Staffing Inc. (www.employmentstaffing.com), based in Shelby, NC, is one of the largest full-service staffing companies in the Southeast devoted to supplying quality alternative staffing services to over 200 clients. A Privately Held Utility Management Company, to Computer Sciences Corporation. Computer Sciences Corporation (www.csc.com) is a global leader in providing technology-enabled business solutions and services. Clayton Capital Partners is pleased to announce the sale of its client, MJSI, Inc. to Danco. MJSI, Inc. (www.gomjsi.com) is a leading manufacturer of innovative water-saving plumbing components. Danco (www.danco.com) is the largest supplier of plumbing repair and replacement parts to the home improvement industry. Clayton Capital Partners is pleased to announce that its client, Evale Foods, acquired an interest in The Healthy Pantry, Inc. The Healthy Pantry, Inc. (www.thehealthypantry.com), offers cooksimple™ nutritious meal kits to provide a solution to the growing trend of poor diet, nutrition, and obesity throughout the United States by reducing the time required for healthy home cooking. Evale Food Group (www.evalefoodgroup.com), based in St. Louis, MO, is comprised of accomplished entrepreneurs, senior level executives and individuals with a commitment to providing healthy food choices to the consumer marketplace. Clayton Capital Partners is pleased to announce the purchase of Semiconductor Tooling Services, Inc. by its client, Watlow. Semiconductor Tooling Services, Inc. (www.semicontooling.com), based in San Jose, CA, is a leader in ion implant refurbishment and elastomer bonding technologies. Watlow (www.watlow.com), headquartered in St. Louis, MO, is the largest custom designer and manufacturer of industrial electric heaters, sensors and controllers. Clayton Capital Partners is pleased to announce the sale of its client, Allied Appliance Sales to Indoff, Inc.
Allied Appliance Sales (www.goallied.com) is a marketer of appliances – including air conditioners, kitchen appliances and commercial laundry equipment – to the multifamily housing and hospitality industries. Indoff, Inc. (www.indoff.com) is a distributor of a broad range of business products including commercial interiors, material handling and storage products, office supplies, promotional products and commercial printing. Clayton Capital Partners is pleased to announce the sale of its client, fpsCMI, to Engineered Corrosion Solutions. fpsCMI (www.fpscmi.com) is a corrosion management consulting firm specializing in corrosion management for both new and existing water-based fire sprinkler systems. Engineered Corrosion Solutions, based in St. Louis, MO, is a provider of corrosion management services. Clayton Capital Partners is pleased to announce the sale of its client, SafeBridge Consultants, Inc. to Trinity Consultants a portfolio company of Gryphon Investors. SafeBridge Consultants, Inc. (www.safebridge.com), based in Mountain View, CA, is a leader in the toxicology and industrial hygiene sector supporting the pharmaceutical, biotechnology and fine chemicals industries globally. Trinity Consultants (www.trinityconsultants.com) is a leading international environmental consulting firm specializing in industrial air quality issues. 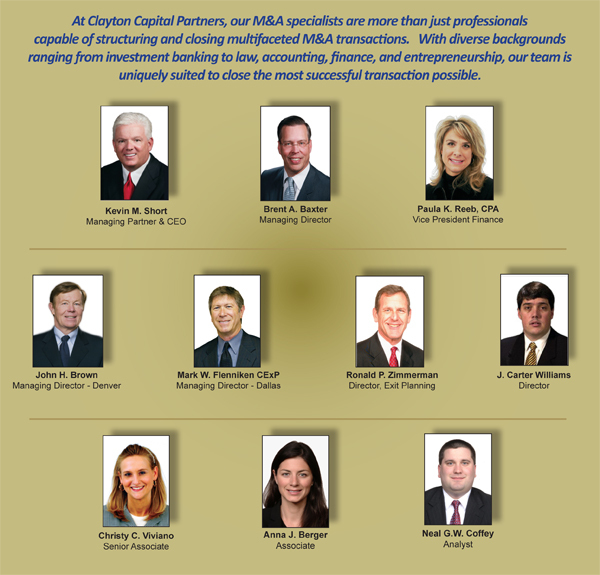 Gryphon Investors (www.gryphon-inv.com), based in San Francisco, is a leading middle market private equity firm. Just-released statistics related to mergers and acquisition activity in the third quarter of 2013 are the usual mixed-bag of good news and bad news. According to Capital IQ, "Lower middle market transaction volume increased slightly in Q3 2013 compared to Q2 2013, while transaction value increased by 18 percent." Well, an increase in transaction value is good news. We all want to reap top dollar for our companies. The slight increase in transaction volume also might indicate that more buyers are coming into the marketplace after years of sitting on the sidelines. But what's the context here? While the market may have improved from quarter 2 to quarter 3, the volume in this market segment during quarter 3 of 2013 was down 25 percent from the same quarter in 2012. The big picture matters. Here's another statistic from Capital IQ that caught my eye because of the mixed message it sends to business owners: "The proportion of M&A deals (in the lower middle market) completed by strategic acquirers increased in relation to financial sponsors." Let's look quickly at these two types of buyers. Financial buyers use financial formulas, usually based on a desired rate of return, to determine the price they'll pay for companies. A private equity group (PEG) – unless it is making an acquisition to add on to an existing holding - is a classic example of a financial buyer. A strategic buyer, on the other hand, is one who bases its purchase offer on its perception of the target company's future value: how well it expects the target company to perform under its management, or how successful the acquisition will be once it can take full advantage of the buyer's better market distribution, name recognition or proprietary technology, etc. Is this increased activity among strategic buyers a glass half-full or half empty for business owners? On the one hand, more strategic buyers in the marketplace improve the possibility of getting more money for one's company. Strategic buyers (competitors, verticals, industry players and adjacencies) are often willing to pay more for a target than are financial buyers. On the other hand, the financial buyers (often private equity groups) may pay lower prices, but they have deep pockets, bring management expertise to the table and are often the best-possible buyer for owners who want to take some chips off the table, but aren't ready to ride into the sunset quite yet. I compare statistics in the investment-banking world to beauty: The meaning is in the eye of the beholder. What is statistical good news for one type of business owner (one that wants to raise capital for expansion or sell off some portion of her company to reduce risk) may not be quite as attractive for the owner who wants to sell the entire company for top dollar. mega-market statistics. Instead, we should use them to think about how our companies must one day match the requirements of whatever type of buyer is active in that future marketplace. Statistics are simply the background for how we owners will write the last chapter of our business ownership stories: the sale of our companies. Kevin Short is managing partner/ CEO of Clayton Capital Partners, an investment banking firm that specializes in mergers and acquisitions.